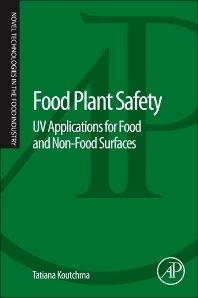 Food Plant Safety: UV Applications for Food and Non-Food Surfaces discusses the fundamental principles of ultraviolet (UV) light technology, and gives practical recommendations on UV processes and systems design for specific processing operations, as well as how microbial efficacy of UV light can improve the quality of existing product lines. Innovative research of ultraviolet light for food applications has been growing worldwide. With increased consumer demand for fresher, minimally processed but safe foods, comes the need for novel technologies to meet that demand. Ultraviolet technology has been taking its niche in food production as a non-chemical treatment to control and enhance safety of processing plants and storage facilities. This concise resource covers the fundamentals of this promising technology and its applications; it will benefit a broad audience of professionals in food engineering, processing, and product development, as well as graduate level students. Tatiana Koutchma is a research scientist in Agriculture and Agri-Food Canada (AAFC). Before she joined the AAFC, she was a research associate professor at the National Center for Food Safety and Technology (NCFST) at the Illinois Institute of Technology in Chicago. She received her doctoral degree in Food Process Engineering in Moscow State University of Food Production. Since 1990, she has had successful international experience in Russia, USA and Canada working in academia and government research programs in emerging food processing technologies. In the last 18 years her main research focus and interest has been application innovative technologies like UV light, microwave heating and high hydrostatic pressure for improved food safety, security, shelf life and product acceptability. She initiated research programs on UV light for food preservation and was actively involved in core functions associated with R&D, process design, and validation of this technology for food industry. She also contributed to the approval of a number of international regulatory submissions on UV applications for foods, milk and ingredients. Dr. Koutchma is a graduate faculty at University of Guelph, Chair Elect of Nonthermal Processing Division (NPD) of IFT, and Canadian Ambassador at the Global Harmonization Initiative (GHI). She is also associate editor of the journals Food Process Engineering and Food Science and Technology International. Dr. Koutchma has authored four books on UV light for foods, as well as 10+ book chapters and 70+ peer-reviewed publications. She is an invited speaker at numerous international venues and delivers training for industry and government professionals. As a contributing author of the “FoodOnline” and “MeatingPlace” Dr. Koutchma is an active promoter of non-thermal processing technologies to the professional community.